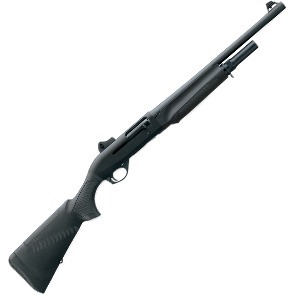 Benelli has a great assortment of self-defense shotguns, but we’ve gotta go with one of the inertia-cycled semi-automatic models. Hate cleaning that gas junk in shotguns after all – we’d rather save that time for eating pie over the holidays.As long as you’re shooting 1 ounce or heavier 2.5” or 3” loads, you should be good to go in terms of semi-auto reliability.Oh, and we’re going old school without the pistol grip option. But we are getting the ComfortTech stock to minimize shoulder pummeling.